Click here to download from Visual Studio Gallery. Search (Google, Yahoo, MSDN, Code Project, Stack Overflow and more…) for the selected text/item. Supports most of the Visual Studio Versions. Quick Search Box, that can be used to search anything. Quick Search Box\Default Search can be called by shortcut key. Currently this Add-in works fine with Visual Studio 2005, 2008, 2010. Please share your suggestions and feedback. Thanks. The basic source code and other details are uploaded in codeproject.com. It has been take care. Hi Jon, please show your support by giving a quick review in VS Gallery. It only takes a few seconds. HI Jon, Thanks for the suggestion, I will update the same and will post it in Visual Studio Gallery. Any other URLs can be added in the custom URL section. Do you have any other points that will make the WebSearch much more useful. Seems to have a bit of a menu conflict with GitExtensions. Thanks for reporting this, please share the GitExtension download URL, so that I can check the same. I’ve also noticed when I try to move the WebSearch menu to the bottom of the context menu by clicking that option, it doesn’t move, it stays on top. 1) When editing any other file than code files (for example, .cshtml) Web Search doesn’t appear in the TOOLS menu neither in the context menú. 2) When default setting modified, it doesn’t change shortcut key and says “Error getting Web Search Key” and shortcut Group in settings dialog appears as disabled. 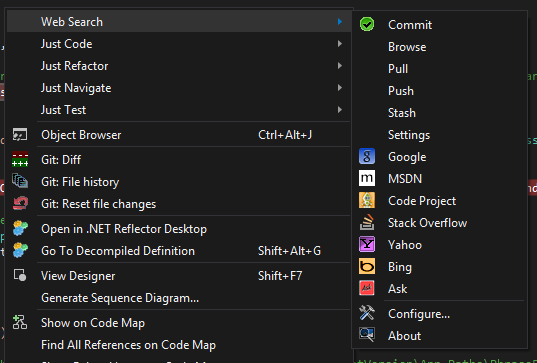 * In VS2012+ it would be great if the search result window were a “temporary” window when using Visual Studio as web search browser. In that way anyone could “forget” to close it if needed or promote the Window to a regular one if they want to. Well Done…I expect to be using this constantly. I noticed that when this is used on a 4K monitor setup the configure dialog is condensed with the text all overlapping making it unusable. Perhaps a resizable dialog would cure it. I use Visual 13 at 3840 x 2160. I can live with it but thought you would like to know. Thank you so much for something so useful. Hey, any chance for VS 2015 support? Any update on VS 2015?